Powerful war machines of the far-future collide across a barren desert world in this post-apocalyptic debut novel from award-winning Australian author Cat Sparks. Cat Sparks is a multi-award-winning Australian author, editor, and artist whose former employment has included: media monitor, political and archaeological photographer, graphic designer, manager of Agog! Press and fiction editor of Cosmos Magazine amongst other (much less interesting) things. She's currently grappling with a PhD on climate fiction. "Filled with effortless worldbuilding that will have you shaking the sand out of your shoes after each chapter, this post-apocalyptic thrill ride is not to be missed." --B&N Sci-Fi Blog, "The Best Science Fiction and Fantasy Books of February 2017"
"Forget the Mad Max comparisons: Sparks is far more ambitious than that. Lotus Blue is A Canticle for Leibowitz by way of Neuromancer." "A mythic, far-future outback populated by superhuman soldiers, house-sized reptiles, and half-crazed armored vehicles: If that doesn't sound incredible to you, you have no heart. Lotus Blue is the year's most compelling science fiction novel." "Astonishingly rich in ideas and concepts and the world building is truly breathtaking in its breadth and originality. Lotus Blue is a revelation." "Lotus Blue is sci-fi author Cat Sparks's debut novel, and for a first journey it's a hell of a ride. As intelligent and thought-provoking as it is exciting . . . From the opening paragraphs you can feel the desert heat and the sand whipping your face." "Lotus Blue is SF adventure on steroids. A dystopian vision worthy of H. Rider Haggard and the Mad Max film franchise." "Vivid, compelling, and relentless, Cat Sparks makes you care about the soul of a mecha future as you hang onto the edge, feeling the sandy grit between your teeth." "Strong-minded women to root for, self-driven, sentient war mech, and a broken, raw world make Lotus Blue the latest and greatest of recent post-apocalyptic stories. An imagined future that leaves you discomfited, but an engaging read that leaves you satisfied." "A post-apocalyptic vision from Australia. Sparks' debut is ambitious . . . but patient readers will find it ultimately rewarding." Really interesting story. I found it a bit hard to follow some of the in world terms at first but got it by the end and found it very imaginative. "Lotus Blue" is a pretty brilliant book. Memorable characters include: Star, the crunchy young protagonist whose childhood secrets are closely kept by her healer sister, Nene. Quarrel the Templar, an engineered pre-Ruin soldier, part organic and part machine, worshipped in places, reviled in others. Allegra, a rich girl from Fallow Heel, and her father, Mohandas, owner of Razael...and the General, also known as Lotus Blue, an uploaded mind, now military machine, recently reawakened. Just as powerful as the characters are the rich settings. Including the Obsidian Sea, a flat, melted, black remnant of a pre-Ruin metropolis made dangerous and enticing by whale-like, sentient wild tankers; the toxic Dead Red Sands, reclaiming fertile farmland as far as the eye can see; and the Sand Road, dotted with safety-providing Sentinels, which lead caravans by warlord-controlled wells to trading towns such as Fallow Heel. There, red cedar tall ship Razael, set on castors and magnificently restored, berths beside junk heaps like the Dogwatch. Meanwhile, bunker cities Axa and Nisn hide their own intrigues. The action blends prehistoric-like beasts and age-of-sail/space piracy with Tatooine-style shoot-em-up and futuristic battle toys gone feral. Also very pleasing are the Australianisms hidden everywhere in plain sight. Themes explored here are friendship and morality with a good dash of Gallipoli in all its wasteful, futile glory. Difficult to miss is the combined climate change and singularity worst case scenario. For all of that, I found it difficult to look away! Will read again, when I get my hands on a print copy. 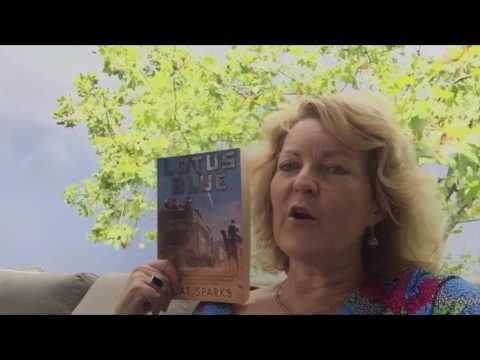 World building is the real star of Lotus Blue, the debut science fiction novel for Australian author Cat Sparks. Very quickly in this novel Sparks creates a vision of a future Australia - an already ancient land - that's further weighed down by centuries of environmental disaster, turmoil and wars so that the 'present' of the novel feels old and tired indeed. Caravans wend their way across the land between scattered outposts as the red desert encroaches more and more on what semi-fertile land is left; towns ruled by bandits or merchants squat in the heat, their dirt walls studded with old and broken tech; deep beneath the ground others rich enough to be able to turn their back on the wars live in hermetically sealed arcologies reliant on failing machinery to keep them alive. Out in the desert battle machines called Tankers, running on corrupted programs, patrol the slagged remnants of the past, hunted by modern-day whalers crossing the wastes on jerry-rigged sandships. And then there are the cyborg Templars, genetically and mechanically enhanced human troops, the last of whom have all but lost touch with their humanity. It's a monumental feat of imagination and the details build through the early chapters until you can see the ruin around you and understand the misery that created it. Lotus Blue stands on its own as an impressive piece of imaginative writing, and one you'll enjoy from start to finish. A striking adventure story set in a fascinating Australia of ruined cities, killer hi-tech storms and cybernetic wizardry. Would love to read more set in this world.